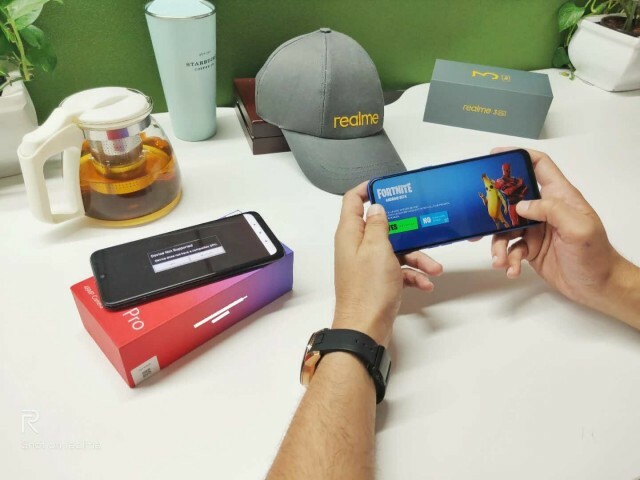 After posting photos from the Realme 3 Pro, brand CEO Madhav Sheth shared an image of the device running Fortnite. His tweet hints at a faster chipset. He commented that other so-called “Pro” devices can’t run the game simultaneously, unlike the upcoming Realme model. It’s not quite clear what he means, but he may be alluding to the new 60fps mode that was Epic Games enabled earlier this year (which was initially limited to flagship phones). You can see a “not supported” error on the phone on the left, whose identity is just barely disguised – it’s clearly a Redmi Note 7 Pro, a device that Realme is targeting. The Redmi has a Snapdragon 675 chipset and that doesn’t cut it. In fact, so far only Snapdragon 855 and Kirin 980 chipsets are supported. That’s not to say that the Realme 3 Pro will have one of those chipsets, its release can coincide with an update from Epic. Still, expect something with a considerably beefier GPU than the Mali-G72 MP3 inside the vanilla Realme 3. The Realme 3 Pro will be unveiled on April 22. CEO has confirmed in a video that it will be Qualcomm chip. He also confirmed fast charger in the package. My guess as mentioned before - SD710 .